Undeniably glamourous, her secret is in her sleek lines. 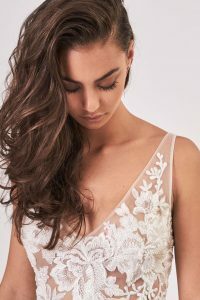 The beautiful bodice has been handmade in a lace that is subtly beaded for a little extra sparkle. The soft matte satin skirt flows to a long , elegant train.